It doesn't get much better than this when visiting southern Madeira Beach! Enjoy first class living in this beautiful 3 bedroom, 3 bathroom condo complete with ocean and pool views. This bright and airy 1,570 square foot property offers everything you need to create a memorable vacation. Designed with comfort in mind, guests will immediately notice the well thought out floor plan that includes a full kitchen with bar seating along with in-kitchen dining for up to eight people total. All utensils are provided, including up to date appliances that any cook will appreciate. The living room provides comfortable seating with overstuffed leather furniture, flat screened television and ceiling fan for added comfort. 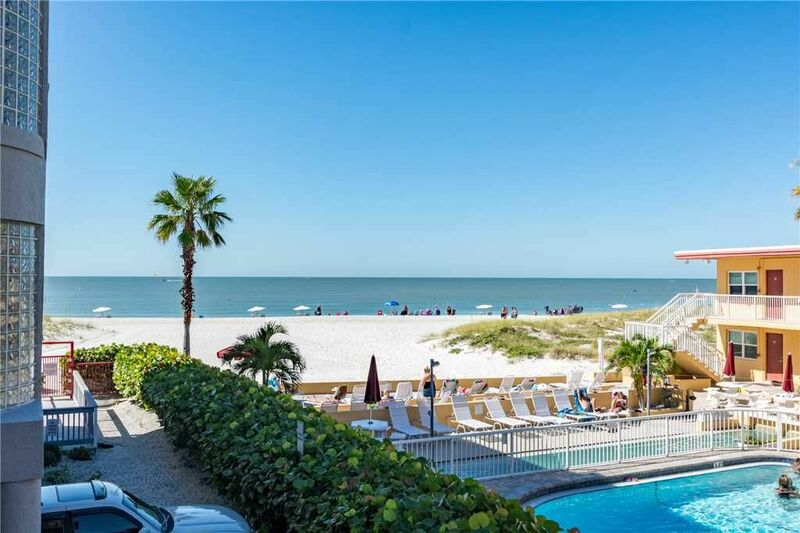 Perhaps the most popular space in this sought after condo, is the large balcony providing views, views, and more views You won't find a better place to sit back and relax while overlooking the beautiful gulf beach and heated swimming pool. Guests enjoy being just steps away from the heated swimming pool, BBQ facilities, and of course, the world renowned gulf beaches. John's Pass is a local landmark and located just across the street. It's a must see for tourists who enjoy a great family environment just steps from their front door. The Pass is a quaint turn-of-the-century fishing village and Pinellas County's #1 tourist attraction. The Village has over one hundred unique shops, a variety of restaurants, the local fishing fleet, dolphin watching and shelling tours, boat rentals, parasailing and jet skiing. Best of all as a SunHost customer you can walk to this great entertainment destination. Anchor tenants include Bubba Gumps, Hooters and Hubbards Marina and also world famous Bamboo Beer Garden. Nearest airports are Tampa International Airport at just over 20 miles and St. Petersburg Clearwater International at 10 miles away. Please be aware there is one parking space for this rental. We had an awesome vacation! Couldn’t ask for better. It was perfect! We all had a great time! Thanks for a memorable experience, everything was far above average. This condo is beautiful with its total renovation. The rooms are bright except for the master bedroom. The two extra rooms are different shades of sea Blue and the master bedroom is dark orange and brown. It’s depressing to be in there. It’s an easy fix with new bedding. Maintenance is quick about fixing things. We have had some elevator problems and hot tub problems but they have been addressed. There used to be an electric grill so I didn’t bring mine but that is gone. All around us the condos have gas grills and we are still using charcoal. I would like to see that replaced. The hair dryer was also missing so I had to buy one. I don’t mind bringing one but there has always been one here. The inconsistency is frustrating. The condo is always clean. The staff are always willing to help you. The pool is great and being on the beach front is wonderful. Even with these minor suggestions I have booked again for next year. the unit has been updated from the pics we viewed for Oct 2017 stay. The updates are fantastic. The location is great.